HALLIE EPHRON: On this Mother's Day, I thought I'd share with you my thoughts about the complicated person who was my mother. When people ask about what it was like growing up in a family of writers, I tell them about her. Phoebe Wolkind Ephron was first generation, her mother just off the boat from Russia and pregnant with her older brother Hal (whom I am not named after, she assured me). She cracked wise like Dorothy Parker and looked like Katharine Hepburn. She marched for Sacco and Vanzetti and voted for Norman Thomas, the Socialist Party of America’s candidate for president. She hated to shop, didn’t do housework, and never chatted on the phone or met friends for lunch. She’d had to quit work when she was pregnant with my older sister Nora. Women had to in those days when they were "with child." And just like that she went from being secretary to a top Broadway producer to walking a baby carriage up and down Riverside Park near the cramped apartment she and my father shared with her parents. She named that baby after Nora, the character who walks out on a stifling marriage in Henrik Ibsen’s play, "A Doll’s House." Fortunately for her, my father knew better than to expect her to be a homemaker. He'd been thrown out of Cornell for stealing books and made his way to Broadway where he was a stage manager for some of the Broadway greats. But he was a closet playwright. For years been churning out plays he couldn’t convince anyone to produce. He asked my mother not to go back to work but to collaborate with him on a play. I love imagining the conversation. "Why not," he'd say. "I have connections." "What, and I can type?" she'd respond. All they needed was a great idea. And she came up with one: An unhappy new mother moves in with her parents in a cramped apartment that’s already crowded with crazy relatives. She arrives, alone and in tears with the baby and a carriage and a pile of diapers. The baby cries. The new mother cries. The maid (it seems even families in two-bedroom apartments had one in those days) quits. It’s a farce with the baby as the whoopee cushion. This was my mother’s brand of alchemy, transforming unhappiness into comedy—her ticket out. From Broadway they moved to Hollywood where they wrote movies for Twentieth Century Fox, and never looked back. My mother called her brand of mothering “letting them make their own mistakes.” She was fairly useless when I got my first period. Couldn’t understand why I might need a bra when I was, as she charitably put it, “flat as a pancake.” Prided herself on letting us walk to school and skipping parent-teacher night. But as a wife her views must have been more traditional because when my father cheated on her, she didn’t walk out on him. She’d lost the power that might once have enabled her to transform her own unhappiness into a hit comedy play. I am, and I do. I thought of her often as I reimagined the end of her life in my novel "There Was an Old Woman." Of course I think of her on Mother's Day. Tell us about your mother, and what thoughts you have about her this Mother's Day. 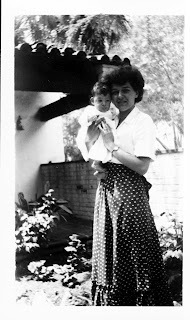 Life was not always kind to my mom . . . . She was home when I was little, worked after my father left. Those difficult years were followed by a happy life after all of us were grown and she remarried. In her last years she struggled through declining health before cancer took her from us much too soon . . . . I could fill pages with the things I remember about growing up with my mom, but I will just say that I remember her strength, her faith, her love, and I miss her every day . . . . . There is so much subtext and underlying emotion whenever you write about your family, I suspect there is much more inside that wants to break out. Sorry to offer advice to one of my own mentors, but maybe there's a deeper, longer piece of fiction back there for you to tackle someday. Thank you for sharing such personal stuff. It's amazing what your mother can teach you, even when they don't have a high school education. There's no writers in my family, but I do have a loving mother (even in her awkward ways) who encourages me to keep writing. What is it about a mother's love that compels you to continue in your talents? She helps you, nurtures you, and before you know it you're off sailing your own course in life. A mother's love is a unique love unlike any other. Thanks for the thoughtful thoughts, Jack... And I do believe you're right. There will be. In fact, not all that buried in the fiction there already is. Agreed, Ken Lang - it is so special. And as dysfunctional as my mother was, she loved us unconditionally, which I agree is the best gift of all. Joan, your mother sounds pretty amazing. Strength, faith, love. That's quite a trio. What Jack said, Hallie. What a complicated woman your mother was. Mine, too, and she still is, but in such a different way. My own children cannot fathom the woman who raised me as they see the woman she is now, someone 180-degrees different from how she was then. Instead of the loving and supportive person they know, her knee-jerk response to us when we were kids was always as to an irritant; no unconditional love there. She tortured my poor hair, trying and failing to get me to look like Shirley Temple, and she used to say my sister was ugly, right in front of her. But, she got a lot of things right, like teaching me to read when I was four, and like not keeping me from having a nose in a book my entire childhood, and by encouraging my sewing talent. (Even though she pimped me out as a seamstress to her friends--my first paying jobs.) I had to raise myself, in many ways, but on balance, that is not altogether a bad thing, either. Now we are friends, and that's a really, really good thing. Happy Mother's Day to all the JRW crew, authors and backbloggers alike. Karen, Thelma - your comments got me thinking about how mothers are human too... (we) are who (we) are... most of us just trying to do the best we can. And of course I wonder what my daughters will have to say about me when I can no longer defend myself. Hallie, I really doubt that you need worry about being unable to defend yourself! For one thing, our mothers are never really gone -- we can always hear what they would have said. When I proposed spraypainting the brass lamps rather than dealing with the tarnish, I had three generations show up inside my head to denounce that plan, and great-grandma died twenty years before I was born! So, trust me, you really *are* guaranteed the last word. For another, being human and admitting that you're just doing the best you can is absolutely the best defense -- and the greatest gift! I know a lot of people who spend their whole lives "searching" for their parents -- trying to get past whatever mythology their parents created to disguise their own fallibility. Those of us who grew up knowing who our parents really were: people who made mistakes, acknowledged them (usually laughed about them!) and then moved on -- we are way ahead in being able to live our own lives, I think. Your daughters are very lucky to have a mother who has been open and honest about herself as a person, and I'm confident that they know that. My mother did NOT allow us to celebrate Mother's Day or Father's Day and a few other holidays that she considered simply the commercial world's inventions for selling more greeting cards. That was just one more thing that made me and my two brothers oddballs in our conventional little town in New Jersey. But--BUT--I totally agree with my mother, who is now 90 and failing. And the gift of No Mother's Day is still valuable to me: it still makes me question conventions and try to figure out which ones are actually useful and which ones hold me back. Go, Mom! Since you brought it up, Hallie. My mother was an alcoholic and died young like yours. She was an artist and loved golf, fishing, duck hunting, baking, swimming the harbor, and cooking. She did everything all at once. She made her own canoe. She paddled it down the Concord River and shot her own ducks. Then she cooked them. She made her own hard cider. She drank it. She laid every guy in town. When I see them today, they still ask about her. So do their wives. And their kids. I was born in Salem Hospital, but my mother had to leave Danvers State Hospital to have me. She worked at Maddie’s in Marblehead and drank all the 150 proof Demerara rum one day. She was fired. She walked across the parking lot to our house on Front Street and threw up all over the dining room floor in front of my girl friends. When she woke up the next day she gave me a $20 bill and said, "Go find somewhere else to stay. I’m going to Vermont." The next good time we had together was when she was dying. People were visiting her. It was like a big show right there in the Huntington Hospital in Pasadena. My then-future sister-in-law brought balloons that she stole from a party on the way over. My father's actor friends were there, and all their writer friends were coming and going. One guy was reading to my mother from his latest book. I don’t know where my father was. Yeah, I think I do. Three guys brought scripts. My yet to be sister-in-law was doing a reading for a film director in the corner behind a big plant. Michael Cavanaugh walked in and asked me if I had a pin. The nurse said, “Here, Mr. Cavanaugh. Take these.” He handed my mother a needle. He gave me a needle. Then he told everybody else to get out. He pulled the baloons down from the ceiling. We laughed and laughed and popped all the balloons. Then my mother died. My mother, 20 years old, had to leave her job as a secretary in NYC for Standard Brands, when she was pregnant with me. She turned 21 a few days before I was born. We lived with relatives -- crowded, right after the war years. She is now 87, and has both suffered greatly (both my brothers died too young) and experienced great joy (a second marriage at the age of 75!). In many ways she has been a role model, but we are not emotionally close. She is judgmental, sometimes terribly bitter, and -- the toughest part of all -- when there was a time to stand by my father or to protect us children, she chose the brute. I have a hard time looking at cards for days like today -- although, I wrote her this year that when I was at her house in March, helping to clean and organize, I took out of her filing cabinet a set of "difficult" letters I had written to her. By the way, best gift I ever gave her (that she liked): An American Girl doll, Kit from Cincinnati. Kristi - not sure why, but your comment has me in tears. Happy tears. Lorrie - You are so right! She sounds like a winner. A tough babe with a critic's eye. Denise Ann - she SAVED your letters?! That tells you something, doesn't it? Hallie - YES. We are. I was on my way to bed last night, okay early this morning. When I saw your post was up, I had to read it before going to sleep. Ha ha ha. I was sure something was wrong that I had written your post. I knew I couldn't have. But I could have. Now I have to go to bed. Night night. Kristi, your comment really resonated with me. I think you are absolutely right about having mothers who are up-front about the warts and all. It means we as daughters have a more realistic view of life, and know that being a human is messy and does not always equate to moonlight and roses. I once had a friend who was the oldest of ten, and whose uncle apparently molested her when she was in the sixth or seventh grade. To this day, and she is now 65 years old, she blames her MOTHER, of all people, and is still holding their relationship emotionally hostage. That just makes me terribly sad for them both. My Captcha has the word "intoxicating" in it, Hallie. Ha ha! INTOXICATING - with all its positive and negative connotations. Wow, Hallie. Just wow. What an amazing background. Not all of us had lovely, blithe mothers, and it says a lot that you can make an intimate, compelling story about your renegade mom. I'll try to learn from you! My mother died at 80 of cancer with me sitting in her hospice room singing for her, "Danny Boy" "Irish Eyes" and her favorite "Peg of my heart." My father, a cop, had died when I was just 10, one of four children: older & younger brothers and twin sister. Mom then worked day and night teaching children and building school libraries in our city during the day and instructing college students in children's literature at night. She had grown up the oldest of eight children of my grandfather's second family. When his first wife died leaving him six children, he met my grandmother who had been his oldest daughter's best friend and though there was almost 40 years different in age, they married. My grandmother's mother had died leaving five children when my grandmother was twelve so she was raised by her grandmother. So when I was left with a ten month old baby to raise when my husband finished his PhD and left, my mom pointed out that in our family women raising children on their own was no bit deal. It was almost a family tradition. My mother was a highly intelligent excerise in contradiction. She was tough sometimes and kind sometimes. When my essays and poems were published when I was in elementary school and high school she was proud enough to brag. However when I expressed a wish to either be an actor or writer for a career she was horrified. She was delighted that I became a teacher and librarian. Our relationship was one of contradictions and often rocky but I thank her for giving me important gifts - guts and self confidence. And Reine, if you fleshed that out a bit more, you would have a great short story. I want to know more about all those people, and what an ending. Literally and figuratively. We are all so complicated, not least our mothers. Mine was certainly not the typical housewife of the fifties and sixties. She worked with my father, she traveled with him over a good part of the world, was always ready to try new things--when we went to Europe we ate in working-class restaurants where most of the time we had no idea what we were eating...She didn't invite neighbors to lunch, but she made friends in unexpected places. For many years she was determined to learn to speak Spanish (my parents spent much time in Mexico and had a house there for a decade) although her accent never improved. So many good things, and yet she was also very controlling--supportive unless it was something SHE didn't want me to do. She grew up during the Depression and never talked about it, but the scars were always there. When she went through a period of severe psychotic dementia a few years ago, I couldn't begin to imagine where those demons had come from. I thought I knew her well and now wish I had known her better. All the things I would ask that she can't now answer, although she still smiles at the sound of my voice. Thanks for the wonderful post. My mother is a complicated person who loves obsessively, criticizes with abandon, and still enables my drunken 50-year-old brother by letting him live with her and take half her social security income so he won't have to work. What I do for her now comes from my Southern sense of obligation. I'm writing a short story where thing turn out like I often fantasize they do. I do think there are mothers who pick you up, hug you, and kiss the booboo... and the ones that tell you to pick yourself up, dust yourself off, and get on with it. I'm a hugger and a picker-upper. My mother, like yours, was not. Debs - sounds like life with your mother was full of adventures! And why is it that we only think to ask those important questions when it's too late to get the answers? Leigh - you know, our motto on Jungle Red should be yours: Writing well is the best revenge. I once had an editor tell me that my characters were "too nice." That is what comes, I suppose, from a family where generations obeyed all the "rules," whether written or unwritten, and were perfectly proper (no cheating, no drinking, keeping immaculate houses with very little or no household help-- lots of OCD). They took out their frustrations in passive aggression, but you had to be a lot older to learn that's what it was. My mother wanted nothing but to be a writer, and was happiest when she got a job as secretary to an immigrant factory owner and wrote all his correspondence for him. In her old age, once I showed her how it was done, she sold a number of articles to a number of publications. After she descended into dementia, she told everyone that she had written a column for the local paper-- probably because it was what she'd always wanted to do while she was keeping an immaculate house and obeying all the rules. She raised a family of writers, not just her kids, but her grandchildren as well. But until after she died, we were all-- at least on the surface-- pretty normal. Then the passive aggression turned active, but still, nobody drinks, nobody cheats-- we all still obey all the rules. We're just not all so "nice" anymore-- maybe that'll come out in characters someday. If I live long enough. Oh, "Anonymous" - is there ever a novel in there... a passive aggressive narrator would be just the thing. My wonderful Smom, Norma, who Daddy married after my "mother died" was the sweetest, kindest woman and Norma was "My MOTHER"
Mar - you (and Smom) were so fortunate! Drinking ... it was toxic for my mom, too, Susan Shea. I'm sure if it were today she'd have been put on prozac. Instead it's self medicating up to a point and then it turns nasty and eats its own children. Great stories. Thank you, all. My Mum was in Nursing School when Pearl Harbor was attacked. She enlisted in the Navy as soon as she graduated and served until 1946. She came back to Maine and was introduced to a Law Student from Boston on a blind date. They married as soon as he graduated and 11 months later I was born. I think it's funny that 2 years later I had a sister, three years later another sister, and 4 years later even another sister. And the last two even share a birthday. My mother didn't work outside the home until my youngest sister was in high school. She was a Labor and Delivery nurse and years later when my sisters had babies (all girls), my mother was able to be with them. She was - and still is - a fabulous Mom. She was always there to be a Girl Scout leader, or chauffeur, or laundress, or birthday cake baker using those little sugar letters to spell out "Happy Birthday." My father died in 1985 and I know she misses him desperately. I wish he had lived longer so they could have enjoyed retirement together. Sorry I rambled. I'm very proud of my mother the veteran. And we're so glad to still have her with us. Anonymous, please know that some of us like reading about nice people! Screw relationship tension, that's what I say, and give me a good, solid plot, any day! I had that argument with Sara Paretsky once at Bouchercon... why did VI have to be so nasty -- curt and begrudging -- to Lottie Herschel, who was her elder, a learned woman who had done much to help VI? Ms. Paretsky also gave the argument that women need to learn not to be so nice all the time... but I still think "really? Can't we maybe set an example and coach the rest of the world until they join us in civility and respect?" Marianne! Girls, girls, girls!! My mother had four -- I had two -- and so far it's carrying into the next generation. Don't know what I'd do with a boy baby. Ridiculous plumbing. Such an interesting point, Kristi -- Wish I'd been a fly on the wall, listening to your "discussion" with La Paretsky. Hallie, Thanks for your story about your mother. Despite the tough times you had with each other, you convey the amazing and talented woman she was, how complicated people (including mothers!) can be. My mom and dad died 8 years ago, 14 hours apart. Still miss her. There are plenty of Mom stories in me, but they're just bubbling to the surface. I am so moved by all the comments written here that have provoked and inspired memories. Thank you all. Hallie, you brought me to tears with your story of your mother. I think Jack's right about a deeper, longer piece. My mother got pregnant with me her senior year in high school. My grandmother, who'd only had the chance to finish the 8th grade and was self-conscious about that all her life, wanted her daughter to go to college and desperately tried to find a way for her to have an abortion, which was illegal at that time. I love that picture of my minister's-wife, always-proper grandmother struggling to learn where to get an illegal abortion for her beloved daughter--the mother love that allowed her the courage to step outside the narrow boundaries life in those days allowed her. Of course, she failed because she had no idea how to go about committing a crime or finding anyone who committed crimes. So my mother married a man she adored who put her in the hospital from beatings more than once, who raped her oldest daughter (me) as a child and raped many other grown women, who was a raging drunk, a compulsive gambler, a sociopathic con man, and a handsome charmer. I'm older now than my mother ever lived to be--she died before she turned 50. She was never able to love me and was a bitter, vindictive, and judgmental woman. Also, she had a wicked sense of humor, and she tolerated no fools. She could be pretty witty and charming herself when she wanted--and full of violent rage as well. To people who would blame her, I must explain that she was younger most of that time than my own daughter is now. Mom turned 18 one week after I was born, and by the time she was 28, she had six children. I must explain to the people who would blame her how hard life was for women in those days, especially if they'd made a mistake in whom they married. No one, not even her family, would help her get away from this violent man. She had no way to make a living and support all those children. My great regret is that my mother didn't live long enough to see better days. Her life was pretty much a living hell of violence, alcohol, poverty, and a society that held her in contempt. I like to think I've worked hard all my life to ensure that other women have more and better options and never have to go back to what my poor mother, really just a girl, had to endure. Hallie, thank you, so much, for the gift of this blog. We don't all have fairy tale mothers who support us every minute of every day, and who sacrifice everything for us, so it's lovely to have a place like this to share our real stories. As opposed to the "Christmas letter" stories one sees on Facebook, yes? It's been a great Mother's Day, but this blog has been a rare treat today. A couple of days ago I posted here about my mom's loving, compassionate nature. Today one of my sisters posted on FB that our mom was the kindest person she's ever known, and I wholeheartedly agree. She was definitely a hugger, picker-upper, Hallie. She died at the end of 1997. On occasion I am introduced to people who knew her, and I have lost track of how many of them - men as well as women - cry when they find out I'm her daughter, and then tell me how much they still miss her. I wish I could have shared her with those of you who had a different sort of mother/child relationship. She believed that each of us could accomplish whatever we wanted to do, and gave us full moral support and encouragement. I know she would have enjoyed reading books by the ladies of JRW, and I've decided that Hallie's writing style would appeal to her the most! So I thought it was pretty interesting when your description of your mothering style sounded so much like my mom's! Hallie, this is a great blog offering. Thank you. Debs, that was the very nicest thing to say to me. I'm sorry about the word, nice. Sounds trite. But I can't think of a better one, so I'll just keep writing. Linda, Karen, Deb R - Thank YOU! Hallie, I can relate. One of Mom's (she just turned 90 and is still as ornery as ever) favorite things to say when I was a kid was, " It's better to raise tomatoes, at least you can eat them". Do I need to say anything more? At least she loves my Granddaughter. BTW....the tomato comment is the title of my coming of age book, if I ever finish it. I hope you had a great Mother's Day! I was 15 when I told my mom I wanted to go to college. "Then you better start working because we're not paying for it." The evening before I left for college-the first in my family to attend-my mom caught me in the living room making out with my then boyfriend who later become my husband and now is my former.Caught in this heavy petting moment, she whispered through clenched teeth, "I don't know why you're going to college, you're just going to end up pregnant"and left the room. My mom was tired by the time I came along. If she had any dreams, they were long gone. What remained was a woman, a beauty in her day, who had surrendered to the belief that "It's a man's world"a phrase she repeated often. Did I love her? I adored her. Did she help me get to the next level? With no view of what that level might be for a young woman growing up in the sixties, she did not. I miss her everyday but on Mother's Day, especially. What a great piece! Thank you!